When I gave myself permission to take a break this fall, I had no idea how much I needed that break. And having taken a bit of a breather, it’s clear that I need to slow down to the speed of life. It’s not that the past couple of months have been quiet. Far from it. 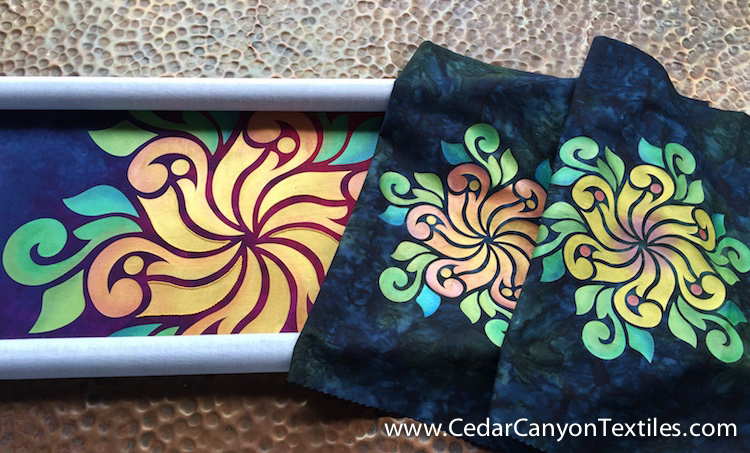 I moved to Chapala for the winter, traveled to Atlanta to teach at the All Things Silhouette conference, painted scale models and the full size image for my next embroidery project and completed a sample for the CraftCast course I’ll be teaching in February. Last week, I traveled to Minnesota to take my sweetheart to the doc for a (very successful) skin cancer procedure and then packed him up and brought him back to Chapala for the winter. And now it’s time to slow down to the speed of life. For the first time since I started my business 20 years ago, I’m giving myself permission to stop thinking about the next big thing for the business, the next class, the next blog post. I’m giving myself permission to think about the next cup of tea, the next stitches to go into my project, the next visit with a friend, and the next dinner with Jack. For now, that’s enough. 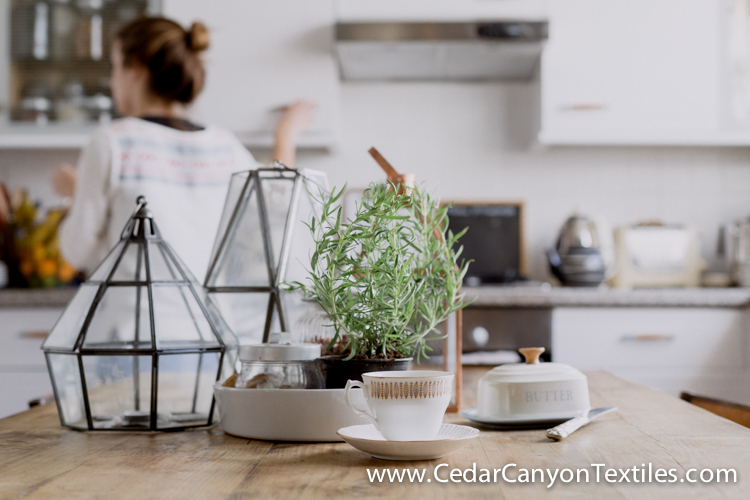 While I take this time to learn how to live in my new home, it will be interesting to see what I miss – and what I don’t. I’m curious to see happens. Can I switch off the observer in me that sees everything as a potential blog post? Can I stop feeling the need to take step-by-step photos and just “do the project” instead of “documenting the project?” Can I stitch for the sheer enjoyment of stitching instead of thinking about how I would teach someone else to stitch? To be honest, I’m not sure how this is all going to play out. It may be great fun, and it may be a bigger challenge than I’m up for. I’ve been doing, doing, doing for a long, long time. Jumping into the next big thing is my default mode. 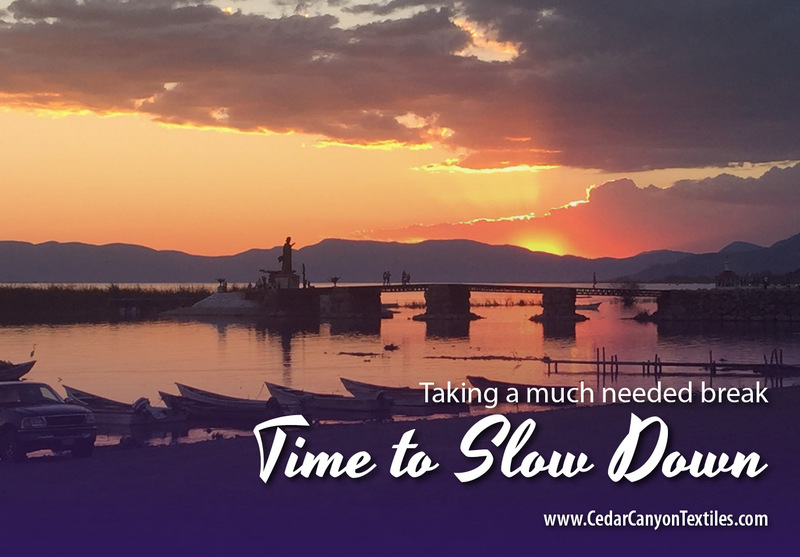 Giving myself permission to stop – or at least to slow down – is kind of scary. So, what’s next? That’s a great question! I’ll send out more details about the class as we get closer to the date – or you can click over to CraftCast and register now. After that? I’m really not sure. I’ll just take things one day at a time for a while and see what bubbles up. I’ll most likely pop in here and there with a short note. Just no regular schedule – at least for now. Good for you! It’s about time! =) Love the colors and design on the 2nd photo from the top! And I remember that Batik…one of my favorites. Enjoy your time down in Chapala and tell Jack ‘hi’ from me. Have a wonderful holiday season together! Thanks, Leanne. As you well know, I’m past due for a time out. I’m having great fun with images and colors from the craft work here in Mexico. They suit me to a T! Glad to hear that Jack’s surgery went well! Enjoy your down time. Looking forward to your Craftcast class. So good to hear good news ! I tried to “retire” aka, ‘slow down’ last fall. It was a wonderful feeling to take the pressure off of myself. Now I find myself creaping back into it. I hear ya, Linda! I don’t think I’m ready to retire, but a sabbatical is definitely in order. I also took some time to slow down this fall. It turned out to be a change of pace, but not really a restful time. I ended up working on a major fund raiser for a prison ministry group. The event was very successful. After it was over, there was a let-down time. I find myself easing back into my stitching and projects for enjoyment and loving it. Will ease back into teaching in January but at an easier pace. Enjoy your time of rest and relaxation. Have a great holiday season with both of you together. Thanks for your note, Barbara. I totally understand your comment about the let-down after a big event. I’ve been there many times. I’m truly looking forward to some down time. We’ll see how long I can make it last. God bless (cursed?) me with a very busy brain and I have yet to find the “off” switch! Love the idea of “slowing down to the speed of life.” Good for you. Enjoy! Thanks, Cindy. Learning to live on “Mexican Time” can be challenging on a good day, but I’m working on it! 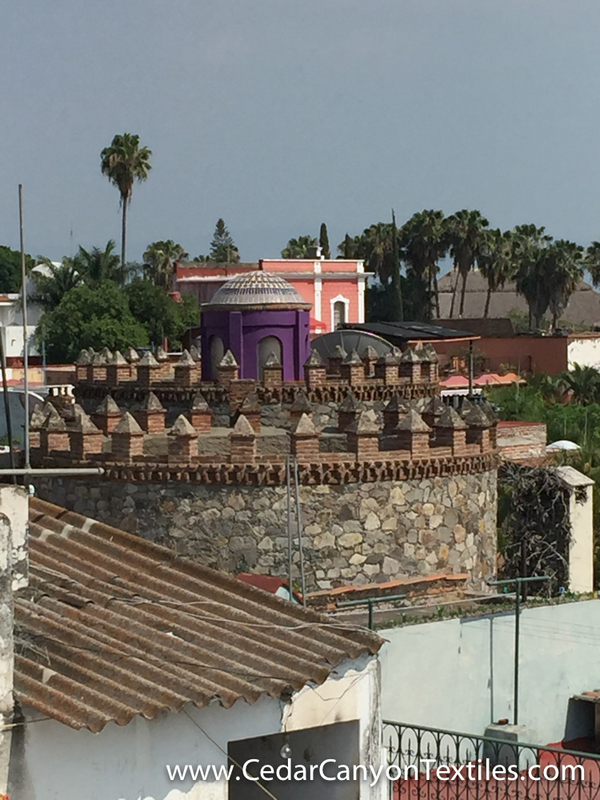 a different drum…… Soak up the magic of Chapala and Mexico. What an opportunity to spend time with your husband and family as you see where exposure to Mexican Folkarts and Culture take you ….. R & R is so important! with other class participants periodically with even a small challenge activity or something like that …..
Merry Christmas and a wonderful New Year to you and your husband. Thank you, Elizabeth. I’m glad you have plenty to keep busy with for a while. I like the idea of a “meet up” for the students. I’ll put that on the “ponder” list as I’m stitching. It will be interesting to have our first Christmas away from the snow and cold of Minnesota. The staff here at the hotel and condo are having a special lunch next week and have invited us to join them. It should be great fun! Glad that you have taken some time to chill. I did do my organ recital and it was very successful. Tonight I accompanied two choral groups on seven pieces, so that is over, My hands are quite sore, but Christmas is coming and lots of hours of music to play. After that, I have a list of things to finish. I have been working on paint stick stuff, let me know if you want to see pics. Have a relaxing time for the holiday season and best wishes to you both. I always love to see photos of your work, Rebecca. 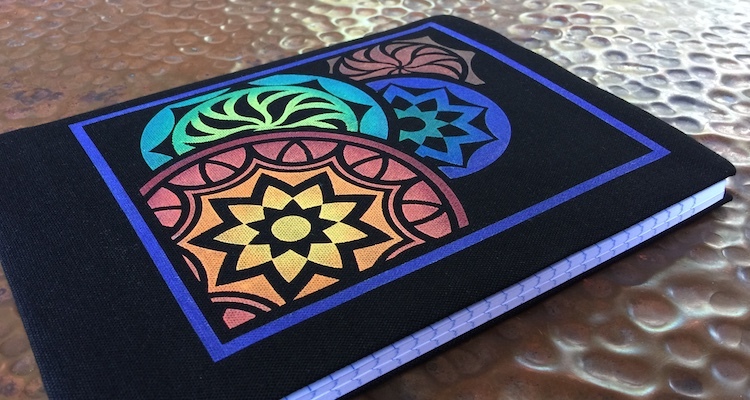 The last set of pics of Kaleido-Designs looked fantastic! It’s truly a pleasure to see what you (that’s ALL of you) make with the things you learn in class and from the blog. Merry Christmas to you and your family as well.